Food Wishes Video Recipes: So What's the Deal with Cornell Chicken? I'm planning to do a video recipe for Cornell chicken, so if you have any information, tips, secrets, anecdotes, memories, or other pertinent details, I'd love to hear about it! In case you've never heard of Cornell chicken, here's a little video tease I found on someone called skeeler1954's YouTube channel. By the way, as someone who appreciates a well-done voice-over, the British narrator in this clip is awesome. If you're from upstate or western New York, and feel like getting all nostalgic, you may want to take a peak at the other videos posted there. Enjoy! Note: I couldn't find a decent photo of Cornell chicken for this post, so I used this picture from our grilled lemon yogurt chicken recipe. I'm from Western New York, south of Buffalo near the PA border, and this is the same exact recipe/method that they used in our area for Fireman's BBQ. The Fire Halls would have a BBQ to raise money and people would FLOCK there to scarf chicken. There's also a place in Alfred (Alfred Almond maybe) called Stearns. They raise and sell live and dressed turkeys, some out of this world stuffing and Stearns BBQ sauce which uses the same ingredients she mentions in the video. Sorry--your substitute chicken just doesn't look right! I live in northern Maine, but Cornell chicken is what I grew up with--the head of the local Birds Eye plant when I was a kid had previously worked in the poultry industry, he started chicken barbecues as church fundraisers that are still a tradition today, and that's the sauce that was always on our bbq chicken at home. My daughter made it for friends when she was stationed in HI and everyone figured it couldn't be any good without red sauce, but soon changed their minds! should be called SYRACUSE chicken, because the orange are superior to the big red in every way. and also the NYS fair is in Syracuse, not in Ithaca. Sometimes the legend is only a legend because somebody says it is. The original recipe doesn't call for overnight marinade. Maybe a brine/vinegar solution. This is the recipe I use that I think makes a better chicken. Anyone know if this is similar to Spiedies? That's a marinade I was just recently introduced to from Bingham NY I believe. It sounds similar, except for the recipe I found for Spiedie marinade has a few more ingredients. ok, this is not same as a Spiedie, which is fantastic in it's own way. I had this countless times attending a great 4-H (Cooperative Extension) Camp several summers, in fact it help fund the camp. Parents came to pick their campers, folks had a half chicken, coleslaw, potato salad and a dinner roll for like $5. 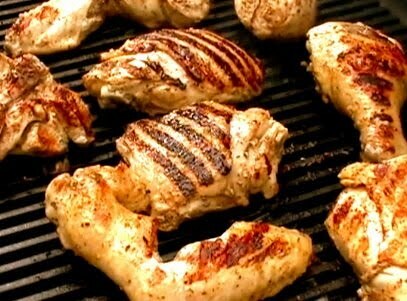 It is better on a pit as you described, but you can do it on a grille just fine. I cut down on the salt, but you can just use kosher salt instead or cut down on amount. I use cider vinegar,a bay leaf, 1/2 tsp cayenne and bag it in the fridge overnight, grilling it the next day. Thanks, Chef John!